Pittsburgh native Elaina Balouris is amongst the four outstanding female distance and middle distance runners who have received a professional contract from the most prestigious runners club in the United States, the Boston Athletic Association. Balouris, and three other women will join the B.A.A.’s new high performance team and will be coached by the B.A.A.’s Terrence Mahon. Three-time U.S. Olympian Jen Rhines (2000, Sydney, 10,000 meters; 2004, Athens, marathon; and 2008, Beijing, 5,000 meters) was the first athlete to become part of the high performance team when the B.A.A. announced the launch of the program last Autumn. “The objective of the B.A.A.’s high performance group of athletes is to support American runners on their way towards making international teams and to compete at the Olympic and world championship level,” said Mahon. The recent William and Mary graduate, this spring, Balouris won her fourth CAA Athlete of the Year award, becoming just the ninth athlete in conference history to achieve that milestone. She capped off her collegiate career by finishing a best-ever fifth in the NCAA 10,000m Championships. That race gave her a third lifetime-best time, 32:46.57, in three races at the distance this year, and it was her 10th lifetime-best performance in 13 races during the 2013-14 season. 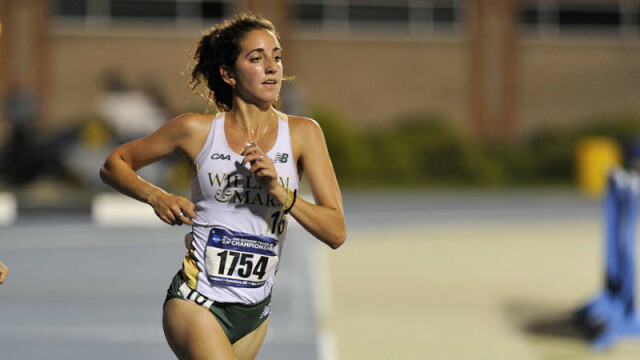 Balouris was a six-time All-American for W&M, the most-ever for a women’s track and field athlete, and earned All-American honors all three seasons as a senior, also taking 14th indoors at 5,000m and 11th at last fall’s cross country championships. She is just the fifth athlete in W&M history to earn three All-American awards in one school year. She graduated from W&M in May with a degree in mathematics, and will attend graduate school at Boston College to earn her M.Ed. in teaching.